I recently acquired a second-hand Rapco 1804M GPS-controlled time and frequency standard. It was supplied with a Garmin puck antenna (perhaps this unit with a BNC connector?) which worked, but proved a little insensitive in this location where I was unable to get the antenna on the roof. Seeing a "high-gain" puck antenna with a long BNC lead advertised quite cheaply by a UK firm, I thought I might try one. You can see the results below - after the 13:00 UTC antenna swap on October 28, the signal level increased and this resulted in better lock with the 1804M. 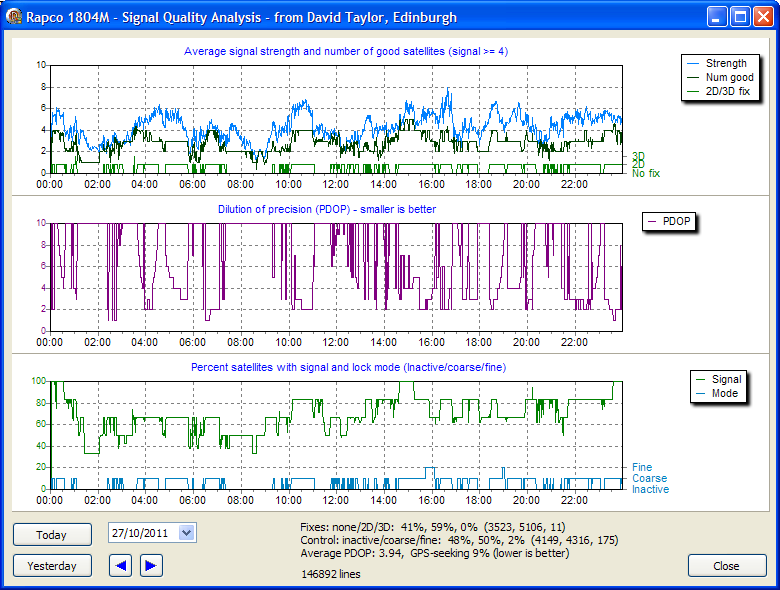 As the GPS coverage varies during the day, it's difficult to be sure that the change seen on swap-over day was purely due to the antenna, so I've provided plots of the day before and the day after which you can see by rolling your mouse over the text links below the graph. You will see that the GPS coverage is broadly similar from day to day, and this is because the orbits of the satellites are designed to repeat approximately from day to day, except a little earlier each day (sidereal orbit). Note how the signal strength increases after the swap, and this appears to result in an increased number of fixes reported by the 1804M. The PDOP reduces (i.e. 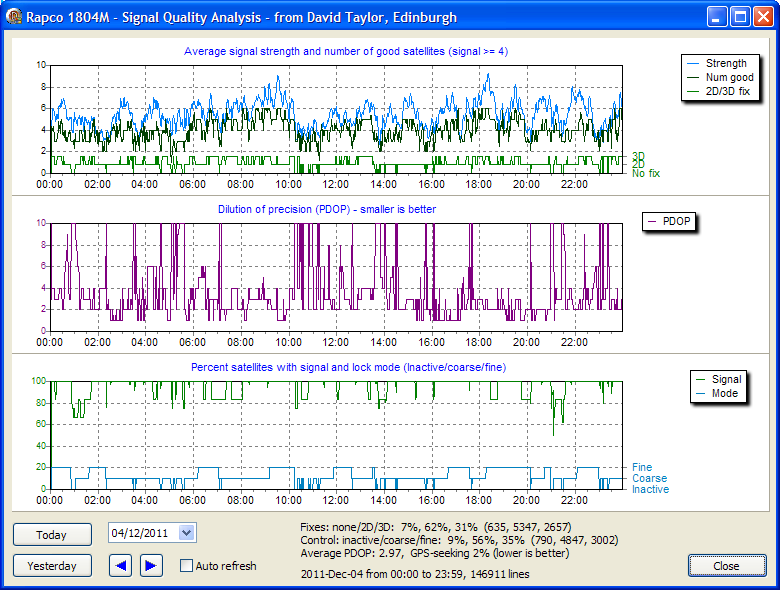 precision is improved), and the percent of satellites which have a signal increases. The "no-fix" reports have decreased from 41% to 18%, and the "Control inactive" reports have decreased from 48% to 23%. The time spent in "fine" rather than "coarse" control increased from 2% to 24%. One drawback of the 6-channel receiver in my particular location is that the unit tries to get the overhead satellites which would provide the best signal with a rooftop antenna, whereas my visible satellites tend to be towards a south to south-west direction and nearer to the horizon. The 6-channel receiver doesn't learn that, so it keeps trying overhead satellites. a 12-channel receiver would find more satellites with an acceptable signal. Perhaps the lack of more visible satellites contributes to the low occurrence of 3D fixes. The first puck antenna I got failed after a few days, the supplier replaced it, and so I am now on my second one. The Garmin antenna remains in reserve just in case! I also bought on Amazon a Gilsson antenna which is highly rated by its maker! It also needs an MCX to BNC adapter (or MCX to N-type if you can find one). 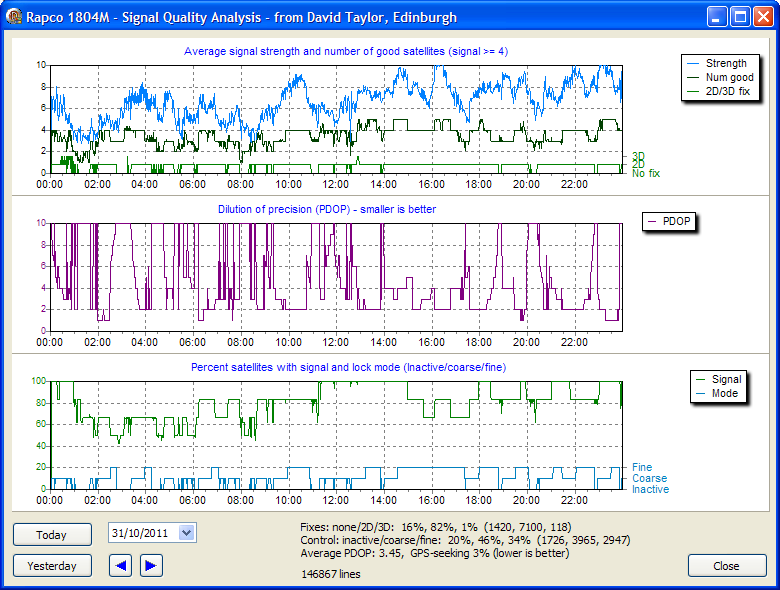 The comparison is shown below, with the swap at 12:35 UTC on October 31. 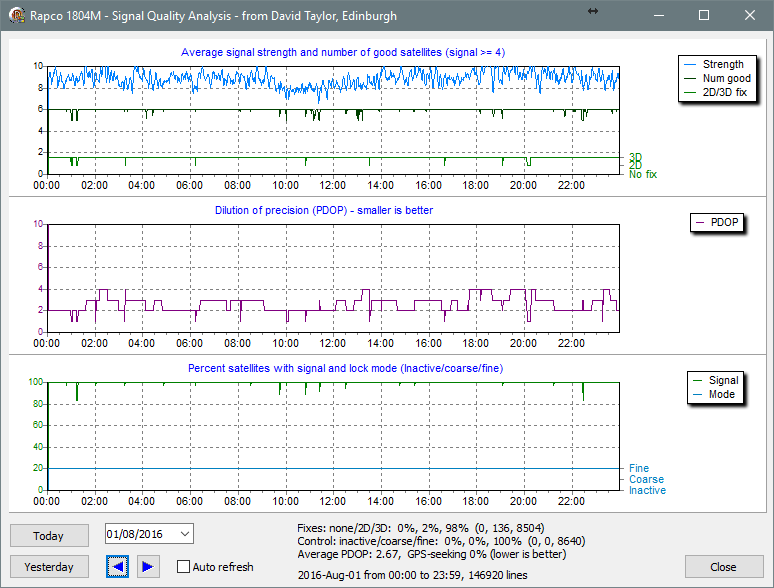 The signal strength has increased again, and the PDOP may be a little better, although I am unsure about this, and the percent of satellites which have a signal increases. The "no-fix" reports have decreased from 19% to 14%, and the "Control inactive" reports have decreased from 23% to 19%. The time spent in "fine" rather than "coarse" control increased from 27% to 37%. I conclude that the 1804M needs a strong GPS signal to drive it properly, and that the 6-channel receiver needs a better view of the sky than today's 12-channel ones. The ultimate sensitivity should be set by the efficiency of the antenna in the puck, and the noise factor of the amplifier it contains. It is unclear to me whether the gain is yet enough to ensure that the performance of the puck is the limiting factor. Discussions on the Time Nuts mailing list suggested that a GPS receiver working to provide time rather than position may be set so that satellites which are nearer overhead are selected in preference to those nearer the horizon. A greater spread may suit navigation better. On this basis, I wondered whether placing a puck at the apex of the loft (i.e. as high as possible while still being inside) which would have a better view of the sky might work differently in this application. I laid a ~12 m length of satellite TV co-ax from the loft to the shack and put the Gilsson puck into the loft. 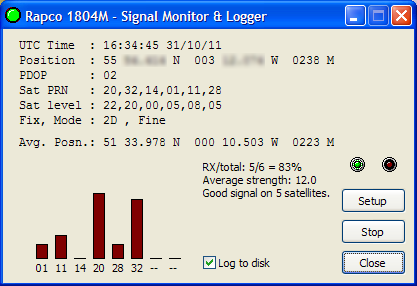 As the puck is now working indoors, and as the cable has about 4 dB attenuation, the signal level will be lower. However, even with this lower level, I noted that the Rapco average position now pointed to my home location, which it had not done before. With these low signal levels, the Rapco spends less time in fine lock then before, but with more time in 3D fixes than before. The AVg. Posn. 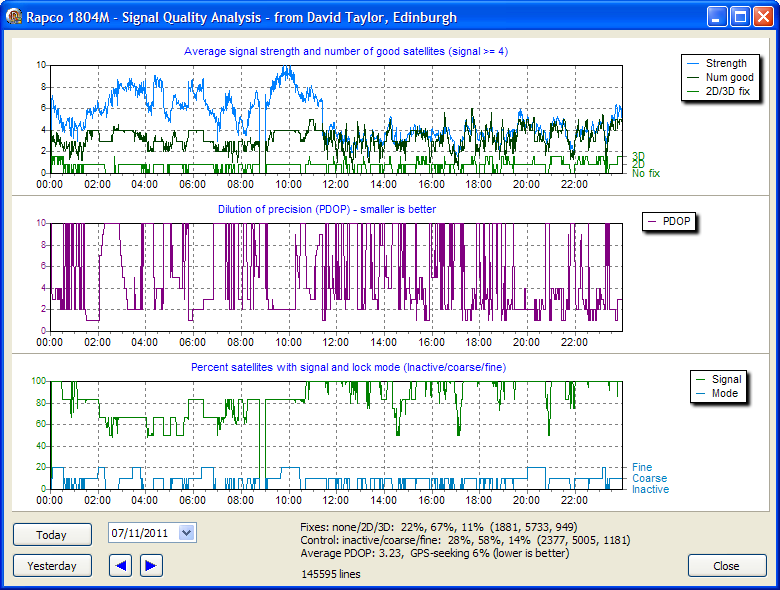 now shows Edinburgh rather than London, so shifting the antenna has perhaps done some good. So I bought a 38 dBi "timing antenna" from China, eBay reference. This has a narrower beamwidth of just 110� intended to capture the satellites which have less atmospheric disturbance (likely not essential in this application). When mounted in the loft, it still has the attenuation of the roof, and it should really be mounted outside. To be honest, this doesn't look a lot better than the Gilsson puck antenna mounted outside the south-facing window, except that the percentage of 3D fixes is higher. 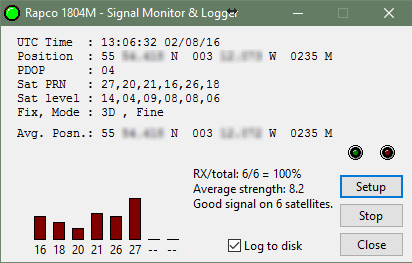 The time when the GPS receiver shows 8 satellites (and is therefore trying to restore a "good" set of satellites) is reduced, but the percent of time that the Rapco spends in "Fine lock" mode is not significantly higher. I'll draw a halt to improvements at this point! Eventually I purchased an outdoor GPS antenna at reasonable cost. I suspect it's intended for a boat as a general GPS antenna, rather than as specialised timing antenna with polar diagram to prefer satellites well above the horizon. This antenna was mounted on a mast to make it approximately roof height. The comparison with all indoor or "window ledge" antennas was dramatic, resulting in almost continuous operation at the "fine" control state. Clearly for these older devices (it only has a 6-channel receiver) every bit of signal you can get into the antenna by locating it appropriately the better! By comparison, modern devices such as the LeoNTP and Leo GPSDO work well with an indoor antenna on the top storey of a building. You'll note that the monitoring and plotting software works equally well under Windows-10. I wrote a small program to capture the serial data sent by the 1804M which saves the stream to a new file every day - about 4 MB in size. I then wrote a small plotting program to produce the graphs above. Both programs are running under Windows-10 here, but should work on earlier Windows as well. I added a small LED to the program's title bar so that red indicates no GPS lock, yellow "Coarse" control and green "Fine" control. I noted that every so often the receiver would produce 8 satellite PRNs and levels rather than the 6 for which it is specified - perhaps this is when it gets desperate to find something and is nearer a reset? Normally, just six channels are reported. From reports, it seems that I may have an eight-channel receiver, and the firmware of the 1804M can accommodate those with channels, but in normal use just six channels are used - as if the receiver is working in 6-channel compatibility mode. I updated the logger program so that you can swipe across the Avg. Posn. line to capture the latitude and longitude into the clipboard for pasting into e.g. Google Earth. You can download both programs here. You will need to tell the capture program which COM port you are using by pressing the Setup button. I found that a simple 3-wire RS-232 connection worked best - send, receive and ground - otherwise you may not get any output from the 1804M if the handshaking signals aren't right. You need to have the Log to disk box checked to keep the data (about 4 MB per full day) if you want to use the plotting program. Keyboard shortcut for the plotting program, you can use the "<" and ">" keys to shift from one day to the next, and you don't need to press the shift key on a UK keyboard as "," and "." are also accepted. 2011-Dec-03, added date to the line count display. Please note that they are free and unsupported, but contact me if you have suggestions or you would like to say "thanks" for the software by making a small donation. Update: 2016-Aug-02, capture and plotting programs updated for Rapco 1804p9, thanks to Ian Ropper for the data. 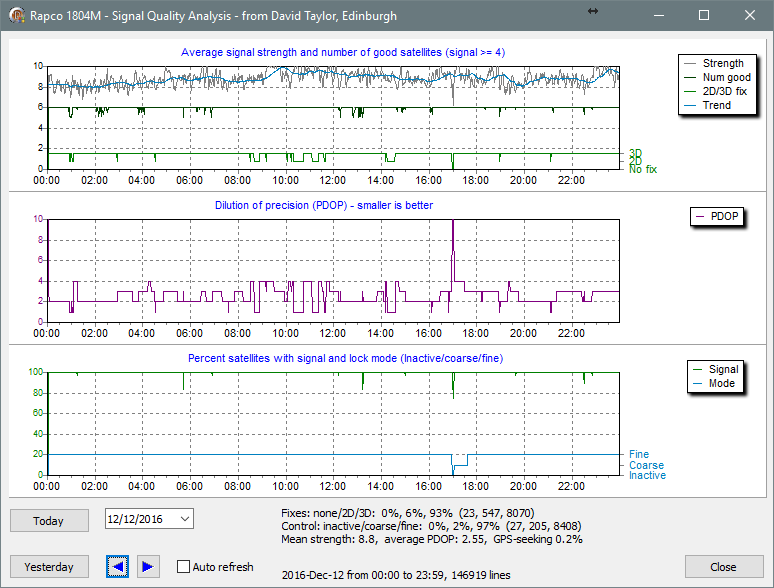 Update 2016-Dec-16, added signal strength trend plot, average signal strength report, increased precision on GPS seeking percent.